The bookcase consists of a shaped and painted gallery to the top with simulated rosewood and boxwood stringing decoration. This leads down to three graduated shelves with two drawers below with original brass lion mask handles and shaped ends to the sides, all painted with simulated rosewood and boxwood stringing & banding decoration. The bookcase stands on four turned legs painted with simulated rosewood and boxwood stringing & banding decoration and terminating with four original brass castors. 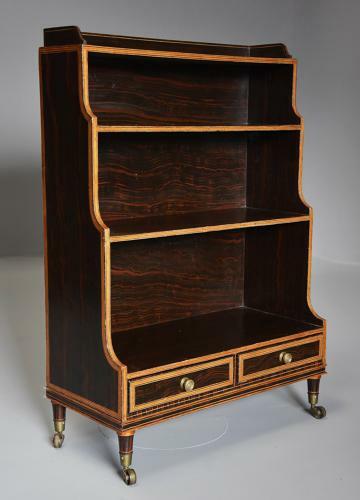 This bookcase is in excellent original condition for age and can go straight into a home, it is rare to find such an item in this good original condition.